“Filet mignon, linda?” asks a server approaching my table with a giant skewer of beef and a very sharp knife. My name is not Linda, though I’m flattered – until I hear him say the same to a woman behind me. Surely, there’s no need to call a guest pretty to convince her that she wants a juicy slice of rotisserie tenderloin? Especially when it’s an all-you-can-eat buffet. Really, it’s an easy sell. I happily accept, and follow it up with carved pieces of alcatra, picanha and churrasco steaks from the steady stream of servers who walk by. Rotisserie should never require monogamy. Only by comparing Texas de Brazil’s eight cuts of beef can you appreciate the differences in flavor, juiciness and texture. For example, the crispy, seasoned exterior of the top sirloin alcatra washes the meat in juicy flavor as you chew, while the thick layer of fat around the circular picanha (the rounded top of the alcatra) protects its bright red interior. But then comes the churrasco – the famous gaucho flank steak with its marbled flesh and much stronger meat flavor than the filet mignon, the prized cut of tenderloin. Chef Godfrey Vargas of the Aruba outlet of Texas de Brazil is a Venezuelan native who worked in a butcher shop before moving into restaurants. 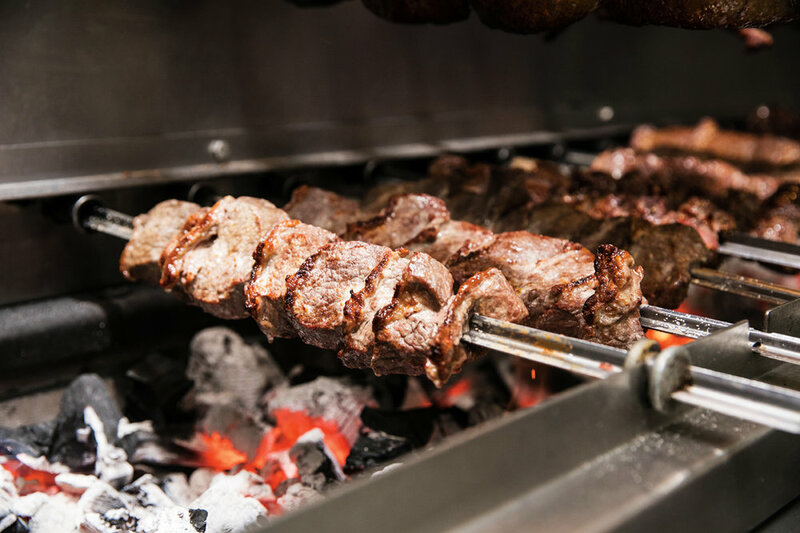 He’s spent the last 11 years in his element at Texas de Brazil, overseeing the 66-spit rotisserie in the kitchen, where charcoal flames gently caramelize the exteriors of skewered meat. In addition to the succulent cuts of beef cooked with nothing but salt (except one of the two filet mignon cuts, to which he adds pepper), he’s responsible for the bacon-wrapped marinated chicken, Parmesan-crusted pork loin and chicken, the leg of lamb and the pork ribs in barbecue sauce – all included in the walking buffet. The marinade for the non-beef cuts is a secret, but he’s happy to tell me about the dishes in the enormous (stationary) buffet. Decorated with a massive floral arrangement featuring pink heliconia, reflected by wood-framed mirrors that wrap halfway around the dining room, it’s far from an afterthought. It takes about four hours every day to prepare the creamy fish soup, black bean and beef stew, extensive salad bar and platters of roasted peppers, pickled hot peppers, artichoke heart salad and sushi, says Vargas. But the results are worth it for vegetarians and omnivores who appreciate the crispy romaine, juicy tomatoes and portobello mushrooms still warm from the stove. Some other secrets he can share include how he coats pieces of alcatra in freshly blended garlic before putting it immediately onto the rotisserie – no marinade time required. Rather than being carved from a larger piece of meat, it’s one of the cuts that comes in chunks, which servers slide whole onto your plate. For anyone looking for a lean piece of meat, try the tenderloin, churrasco and leg of lamb, says Vargas. “The tenderloin is less flavorful than the alcatra, but all the cuts are delicious,” he adds. His favorite? The churrasco. The last shareable secret of the Texas de Brazil experience is that you should try cuts again and again, since each round will be slightly different – one time you might get more of the salty (and in the case of lamb, lemon pepper) exterior and the next, more of the carpaccio-like interior where less salt has infused. Both are delicious. While there’s rarely a moment where you’re waiting for your next cut of meat (turn the cardboard circle on your table green-side-up to let servers know you’re still hungry and red-side-down to take a break), there’s also a private dining option in the exquisite glass-walled wine cellar that offers more intimate service. Speaking of wine, a bottle of South American red would pair perfectly with all the meat, but in true Brazilian style, there’s a menu of caipirinha cocktails, premium sangria and craft beers. “Linda! What happened?” asks my flattering server as he looks at my cleared table with chagrin. My cardboard circle is turned red-side-up and he’s evidently disappointed that there’s nowhere to put the next chunk of juicy garlic sirloin. “No room!” I answer, equally disappointed, because I’ll be dreaming of a bite of that filet mignon mixed with a crunchy, melting bite of churrasco for weeks. We can’t all have Vargas’ dream job, but we can come back again and again. At Texas de Brazil, education is ongoing.